We repair all makes and models of Furnaces, Air Conditioners, Air Handlers, Heat Pumps, Thermostats, Humidifiers, Electronic Air Cleaners, Zoning systems, and UV lights for both residential and commercial applications. 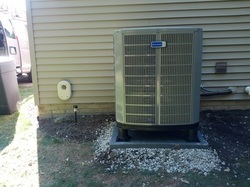 I personally tune-up my furnace and humidifier every fall and my heat pump (air conditioner) every spring. Here is what energy star recommends: "Tune up your HVAC equipment yearly. Just as a tune-up for your car can improve your gas mileage, a yearly tune-up of your heating and cooling system can improve efficiency and comfort. 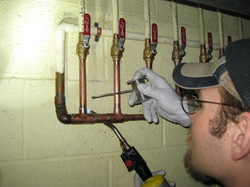 Learn more:"
Installation, Repair, and/or replacement of water heaters (all types), water lines, Hose bibs, and gas lines. Powered oil-less Pipe threader for clean gas line installation.